The Sun is a source of light while the Moon is no more than a reflector. This topic has been under debate for hundreds of years. One side advocates that science is the only universal language understood by all humans, and hence is the importance of addressing the idea of scientific miracles . The other side argues that the versatile nature of scientific findings opens up wide doors for refuters who can hold a strong argument against the Noble Book should one of these scientific findings be proven untrue . Qur’an is not in need of science to prove its authenticity. It is not, and should not be treated as, a scientific textbook. However, scientific signs do exist in the Qur’an. If studied as signs that lead to enquiry, and not definitive facts or miracles, these signs can serve the purpose of developing the human intellect, encouraging people to follow the teachings of the Qur’an: to read, enquire, and research. An amateur yet legitimate description of the sun would be that reddish thing in the sky that is the source of all light and heat that we experience on earth. In scientific terms, the sun is a star that is largely composed of Hydrogen and Helium, which emits light through electromagnetic waves. During their journey to the earth, some of these waves are absorbed, re-emitted, or re-radiated, with only a small portion received on earth . But while we marvel at Allah’s creation of the sun’s power, the moon remains the peaceful satellite that everybody romanticizes about. While light emitted from the moon is the source of its beauty, it is now confirmed this light is actually a reflection of the sun’s light, bouncing light from the day-side to the night-side of the earth . The first claim about the nature of the moonlight is attributed to Thales (625B.C. ), the Egyptian-influenced Greek mathematician and astronomer who learnt in Egypt and argued that the moon receives its light from the sun . Thales’s belief was shared by the Greek philosopher Anaxagoras (500B.C. ), who also claimed that the sun and the moon were huge, spherical rocks. At a time when people believed that the sun and the moon were real Gods, Anaxagoras’s findings were deemed impious, resulting in his imprisonment and banishment . It was not until Galileo’s findings in the 1600s did these claims get scientifically proven, although they too were declared by some priests also as impious, because they contradicted Genesis which describes the moon as “a great light” . Historically, the explanation of moonlight was discussed before the time of prophet Mohammed (peace be upon him), and therefore should not be referred to as ‘miracles’. Muslim scholars who choose to avoid mentioning the theories of ancients, whether intentionally or out of ignorance, help creating a crack in their arguments which eventually lead to a hail of refutations that must be addressed carefully. 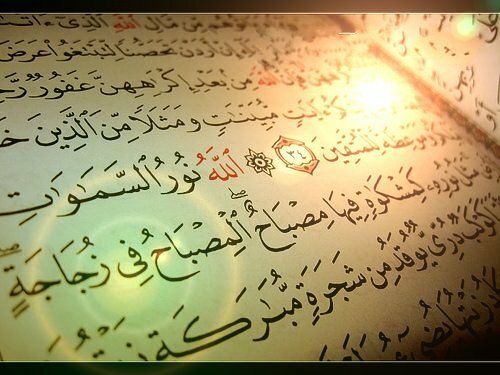 However, the Qur’an does contain verses that distinguish between the nature of the sunlight and moonlight. But before explaining the verses, it is important to remember that Muhammed (peace be upon him) was an illiterate shepherd, who lived amongst people whose passion lied mainly in poetry and literature, not science. Moreover, scientists who proposed these theories were punished for their arguments. If the Qur’an was man-made, why did it propose a discredited argument? In addition, Anaxagoras did have errors in his argument as he claimed that the sun is a rock! While in modern astronomy we all know that stars are just forms of huge gaseous balls. Why, if Qur’an was copied, did it choose to reveal the correct scientific facts and avoid the errors? – “It is He Who made the sun to be a shining glory (Diya’a) and the moon to be a light (Nur)“ [Younus 10:5]. – “And made the moon a light (Nur) in their midst, and made the sun as a (Glorious) Lamp (Siraj)“ [Nuh 71:16]. – “Blessed is He Who made constellations in the skies, and placed therein a Lamp (Siraj) and a Moon giving light (Muneer)“ [Al-Furqan 25:61]. – “And We made a glowing lamp (Siraj Wahhaj)“ [Al-Naba’a 78:13]. In the above verses, Allah SWT uses different terms to describe moonlight and sunlight, the former referred to as ‘nur‘ and latter as ‘diya’a’ or ‘siraj‘. Consulting a dictionary on those terms shows that ‘nur’ and ‘daw’‘ (origin of ‘diya’a‘) both mean ‘light’. However, the Qur’an never uses both terms interchangeably. Here we should ponder: if both lights were identical in nature, why were different Arabic terms used to describe each light source? In addition, why is it that only the sun, and not the moon, is described as a ‘siraj’, or a lamp? There are two types of light sources: direct sources like the sun and lamps, and indirect sources, like the moon and planets, which derive their light from other sources. In more than one verse, Allah SWT described the sun as a lamp, because both the sun and the lamp share the property of being direct sources of light. Arabic language is therefore more exact in using two different terms, ‘nur’ and ‘diya’a’ , that although have the same meaning in other languages, are actually different in terms of what source of light they refer to . The Qur’an also describes the sun as ‘siraj wahhaj’, meaning a glowing or flaming lamp, to show how the sun is luminous and burning with flame. Again, this concurs with the scientific description of the sun as a high energy producer. Allah SWT is Nur, Prophet (peace be upon him) is Siraj? Atheists ask why the Quran doesn’t explicitly state that the moon is ‘light-reflecting’. Read the reply to this claim. Many atheists or Islamophobes reach hard to refute the authenticity of Qur’an. One such refutation questions why the Qur’an doesn’t explicitly state that the moon is ‘light-reflecting’. Another argument, and perhaps the one that mostly hypes up refuters, is that the Qur’an states that Allah SWT is ‘Nur’, and that the Mohammed (peace be upon him)is a ‘siraj’. They claim that this means that the prophet is the source of light and Allah SWT is only the reflector. Such arguments might be valid if the book being discussed is a science textbook. However, Qur’an is a book of faith and guidance, which uses homonymy and metaphors to eloquently reveal its desired meanings. In linguistics, a homonym is a “group of words that share the same spelling and the same pronunciation but have different meanings”. A research conducted on homonymous expressions in the Qur’an explains that ambiguity can result when translating its Arabic text. It shows that almost all translators only use the primary meaning of the word, ignoring any contextual clues that can be used to translate homonymous terms accurately. The ambiguity in religious texts is especially difficult to translate since both the context as well as different scholars’ interpretation must be considered . “Allah is the Light (Nur) of the heavens and the earth. The Parable of His Light is as if there were a Niche and within it a Lamp: the Lamp enclosed in Glass: the glass as it were a brilliant star: Lit from a blessed Tree, an Olive, neither of the east nor of the west, whose oil is well-nigh luminous, though fire scarce touched it: Light upon Light! Allah doth guide whom He will to His Light: Allah doth set forth Parables for men: and Allah doth know all things.” [Al-Nur 24:35]. Allah SWT uses the word ‘Nur’ to refer to His ‘light’ of guidance in the heart of his followers. The Qur’an beautifully describes the extent of purity and clarity of Allah’s guidance by a detailed metaphor that explains how the resulting light is as complete and clear as Allah’s guiding light. Although the sun’s light is brighter, Allah SWT uses the word ‘Nur’ to describe that the light of His guidance looms in the middle of all surrounding darkness. – “Surely We revealed the Taurat in which was guidance and light (Nur)“ [Al-Maeda 5:44]. Nur: faith and wisdom . – “…there has come to you light (Nur) and a clear Book from Allah;” [Al-Maeda 5:15].Nur: Prophet Mohammed (peace be upon him). – “.. follow the light (Nur) which is sent down with him….” [Al-A’raf 7:157]. Nur: the Noble Qur’an . “And as one who invites to Allah’s (grace) by His leave, and as a lamp spreading light (Siraj Muneer)” [Al-Ahzab 33:46]. This explains that the message Mohammed (peace be upon him) was sent with is as clear and undeniable as sunlight in its shine and glory. The lamp is described as ‘muneer (spreading light), and not ‘wahhaj’ (burning with flames) to show that this message shines clearly like the sun, yet peacefully without any burning flames . The Qur’an is not a scientific, non-contextual textbook where each word is bound to a single meaning. Treating the Qur’an in such a way while ignoring spiritual, linguistic, and contextual angles would make it a target to several, yet weak, refutations. A recommendation to whoever wants to argue Qur’anic verses is to first understand the genre of text they are reading, study all the possible explanations available, and prepare their argument using all existing resources. It is also necessary for Islamic scholars not to try hard to prove that the Qur’an preceded established science with the scientific signs it contains. Moreover, they should explore all historical and scientific background before presenting their arguments. The Qur’an is a book of guidance and faith, which also encourages people to read, research, and enquire. Following this approach, we can confidently respond to any atheist claim or refutation, should anyone still have a valid reason to come up with any. Al-Qaradawi, Yousuf (2013, March 11). Qaradawi on Scientific Interpretations of Qur’an-1 : Debate Between Contemporary Advocates & Opponents. Retrieved April 30, 2013. Bassir, A.S. & Dastjedi, H.V. & Rasekh, A.E. (2012). On Homonymous Expressions in teh Qur’an: A Case Study of the English Translations of the Term فساد (Fasad). The Journal of International Social Research, 5(22), 136-148. Griffin, C.W. (2008). Ignorance Is Strength: The Fundamentalist Assault on American Freedom. Indiana, Authorhouse. Longo, Oddone. “Ancient Moons”. Earth, Moon, and Planets 85-89 (1999): 237-243. ​Deena El Shamy is an E-learning specialist/trainer. She holds a Masters degree in Digital Technologies, Communication, and Education from the University of Manchester, UK.